In my latest CSA box I found eggplant and celery. It seemed like the perfect time to try making caponata, an excellent dish for summertime picnics. When I first tried caponata last summer, I couldn’t imagine that I would like cold eggplant, but yum! It’ a complex blend of flavors and textures, that taste great on bread. 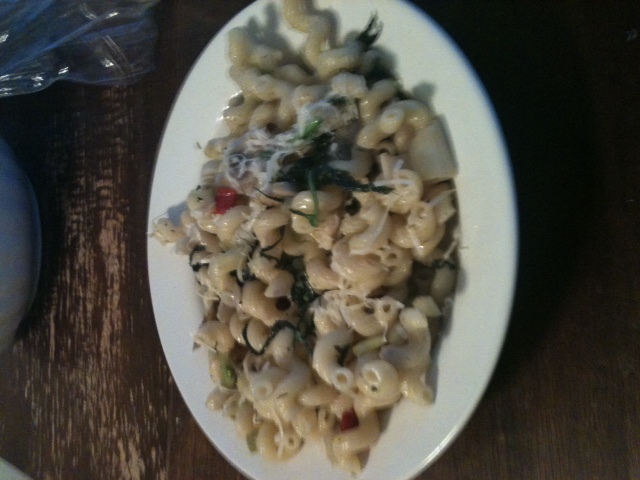 After a little research, I decided to adapt a recipe from Mario Batali (adding celery and olives). First, I ate the caponata on french bread, as it’s normally served. But after a long run this weekend, I decided that adding a little protein would be a great addition and used the leftovers for a fabulous post-run breakfast, with eggs and toast. In a large pan, heat the olive oil over medium heat and add the onions, celery, pine nuts, golden raisins and chili flakes. Stir frequently, cooking until just softened, about 4 minutes. Stir in the eggplant, sugar, cinnamon, and cocoa and cook for 5 more minutes. Add herbs, tomatoes, and vinegar and bring the mixture to a boil. Stir in the olives. Set the heat to low and simmer for about 7 minutes, until it begins to thicken. and remove from heat. This recipe makes a generous few meals, and can be frozen for later. It can be eaten warm, but is traditionally eaten cold or room temperature. I highly recommend it with poached eggs: Set a deep pan of water to boil, once boiling, add a glug of white vinegar, if desired, and give the water a little swirl with a spoon before adding two eggs. Continue gently swirling the water until the eggs are cooked, and then remove them with a slotted spoon. 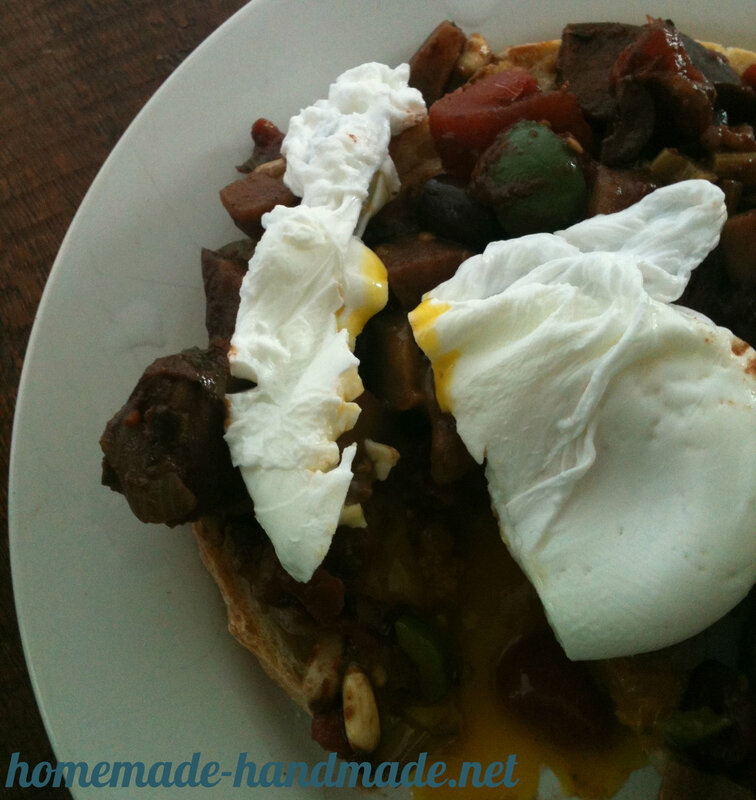 Toast two slices of bread, top with caponata, and place a poached egg on each slice. Ice cream! With fresh cherries! And booze! A few years ago, my awesome former roommate got me an ice cream maker for my birthday or Christmas. I LOVE ice cream. It’s my all-time favorite food. But I don’t make it from scratch that often…and after this week I remember why—it takes a good chunk of time. Making ice cream is a two or three day process. Luckily, the results are usually worth the wait. I always store my ice cream maker cylinder in the freezer, so it’s ready to go when I want to make some (otherwise it’s an additional 24-hour wait while it freezes). I had some very ripe cherries in the fridge that needed to be turned into something, so when I found this recipe by Apple a Day, it sounded perfect. 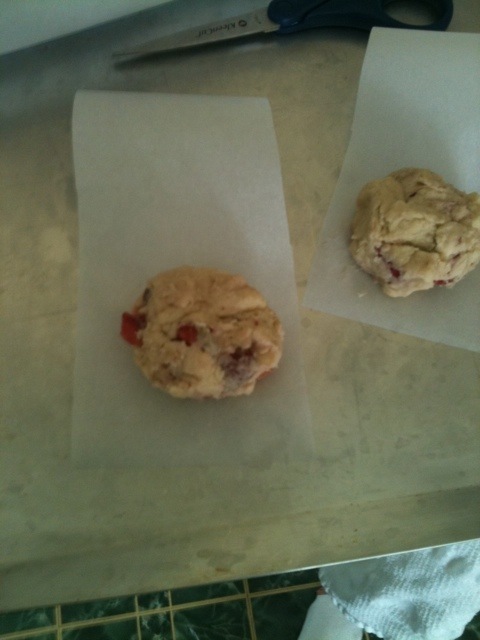 It took one evening to make the custard base and prep the cherries. 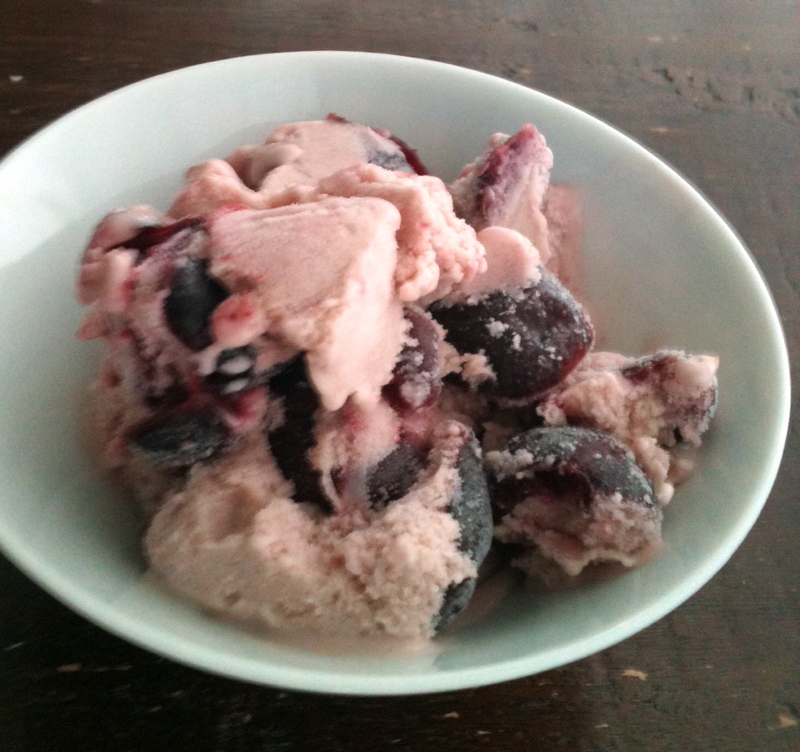 The next evening, I took it out of the fridge and churned it in the ice cream maker. Then it took another day to freeze through. But we tried it last night—and it was fabulous! In a large saucepan, combine the egg yolks and 3/4 cup of the sugar, whisking together until blended. Set aside. Mix the cream and milk in a saucepan. Heat on medium, stirring occasionally, until it starts to steam (about 5 minutes). Gradually add the hot cream to the egg mixture, whisking constantly so the eggs don’t cook. Heat the mixture on medium, stirring constantly until the mixture thickens enough to coat the spoon or spatula and you can see a trail if you run a finger down it. (About 7-9 minutes) Don’t let the custard boil. Place a mesh sieve over a clean, heat-proof bowl, and pour the custard through. Stir in the vanilla. Place the custard bowl in a larger bowl and fill the large bowl with enough ice water to be level with or above the custard level. (This is to cool the custard consistently.) Allow the custard to cool to room temperature—it may take up to an hour. In a saucepan, mix the remaining 1/2 cup sugar, the cherries, and 2 tablespoons of the bourbon over medium-high heat. Bring to a low simmer and cook until the cherries have expelled their juices and softened, and the liquid has begun to thicken (about 10 minutes). Strain the cherries, reserving the liquid. You might have anywhere from 1/2 to 1 cup liquid. In a small bowl, mix the cherries with the lemon juice and remaining 3 tablespoons of bourbon. Let everything cool to room temperature, then mix the cherry liquid into the custard, and put the custard and the cherries in the refrigerator over night. Set up your ice cream maker and churn/freeze the custard according to your maker’s instructions, adding the cherries in the last 5-10 minutes of churning. Since I don’t have air conditioning in my kitchen, it took almost 40 minutes for my custard to freeze to a nice slushy state, which is when I added the cherries. Transfer the ice cream to a freezer-proof container (I used an 8-cup Glad freezer container), and freeze until set—probably at least 4 hours. 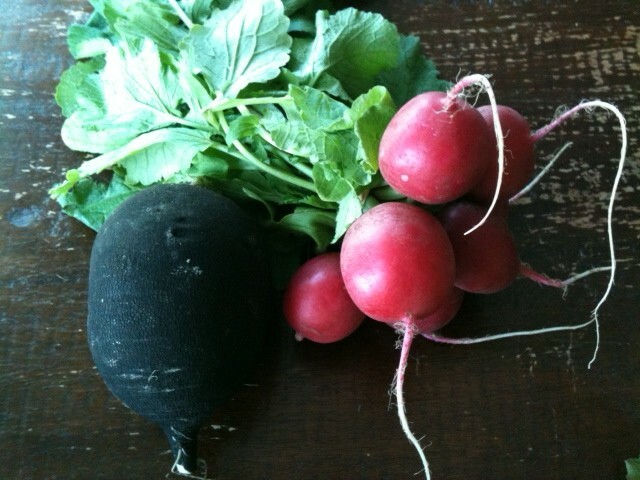 Two weeks ago my CSA’s spring share ended and I moved to a half share for summer. I’m kind of relieved (after all, you know I’ve been having trouble eating everything), but I already miss having a full fridge all the time. 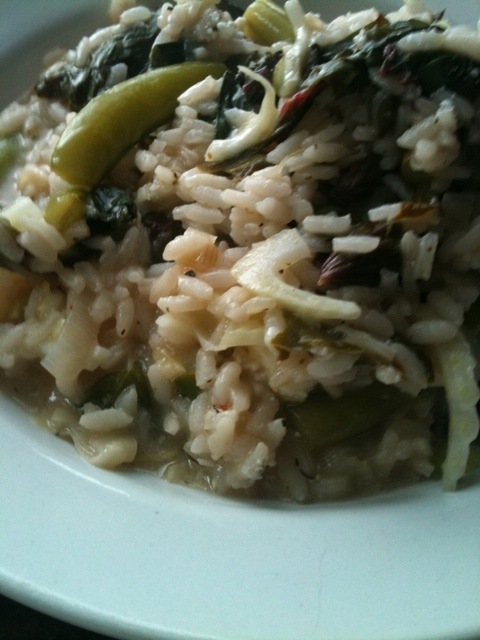 I’ve made the most of my last two batches including a lemony risotto with sugar snap peas, asparagus, Swiss chard and fennel. 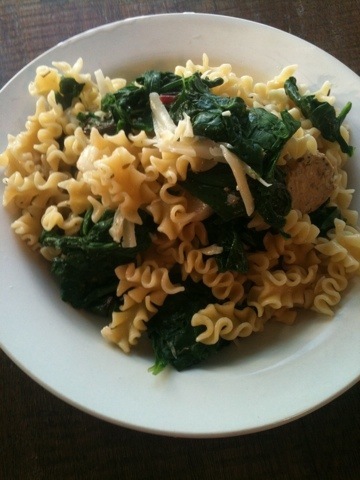 While it was a nice blend of vegetables, it definitely wasn’t a recipe worth sharing. Way too lemony with nothing to balance it out. That’s what happens when you make up your own recipes and just throw stuff in a pot to see what happens—sometimes the results aren’t perfect, even if they’re pretty. This was another “throw stuff in a pot and see what happens” recipe, but I was delighted by the outcome—and it made great leftovers. 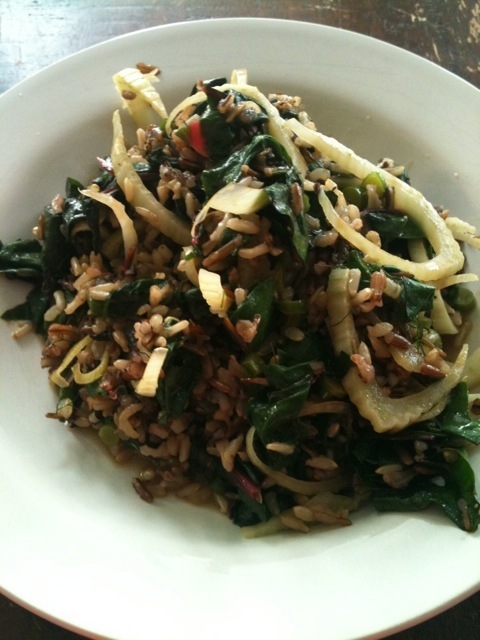 I started with a bag of brown and wild rice blend (Lundberg Wild Blend) from the grocery store and cooked it according to the instructions with vegetable broth and a tablespoon of butter. There was still a bit of liquid when the rice was done, which ended up being a good thing because it coated the vegetables like a sauce and helped my leftovers heat up with out over-drying. (Dry crunchy rice leftovers = eew). 1. Cook the rice according to package instructions (in this case, bring veggie broth, butter, and rice to a boil, cover, and reduce heat to low to simmer for 40-50 minutes). 2. When there’s about 15 minutes left for the rice, begin to warm olive oil in a large sauté pan over medium-low heat. Add the garlic scapes and cook gently until just soft (about 5 minutes). 3. Increase the heat to medium, and add the sliced fennel. Season with salt, pepper, thyme and cumin to taste (I used a dash of the first three and was rather generous with the cumin). Cook until the fennel is tender, but not soft, about 5 minutes. 4. Add the chard ribbons to the saute pan, and cook until barely wilted. Check the rice and see if it’s done (as noted above, I went by texture, not amount of liquid). Add contents of rice pot to saute pan and stir together. Serve warm. 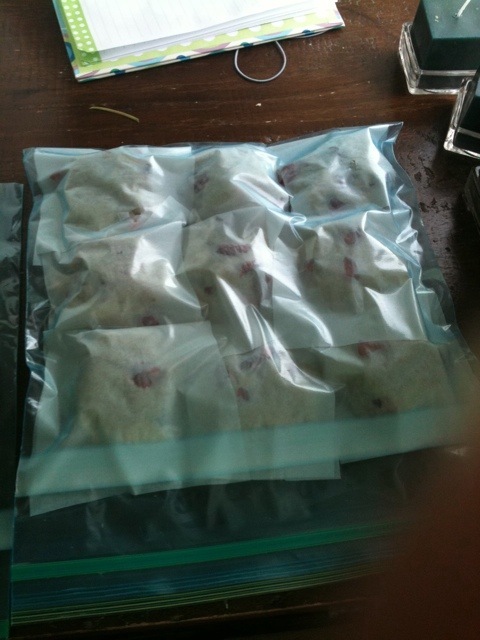 …and thrown them in a freezer bag. Then I bake them according to the recipe instructions. This is a trick that I learned from Deb at Smitten Kitchen (she mentions it right in her recipes if you can make them ahead, which is fantastically helpful). 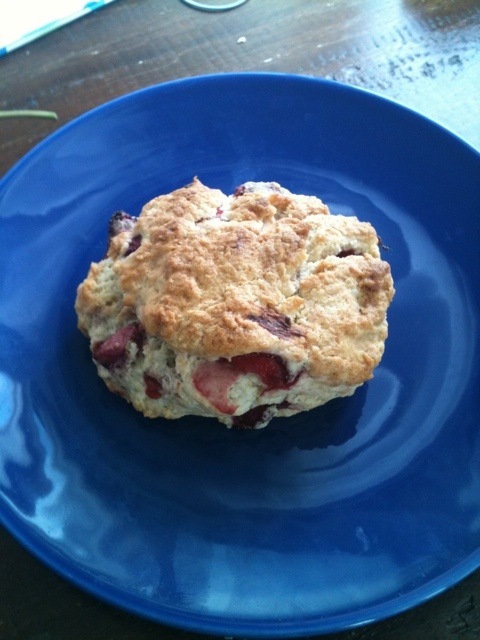 Since scones are best right out of the oven, it’s nice to have a supply in the freezer! My first week with the CSA was pretty much as success, except for one thing: Many of the greens wilted before I had a chance to eat them. Luckily, the CSA-blogging community (who knew such a wondrous resource existed?) came to my rescue and suggested that I bag the next batch to keep moisture in. 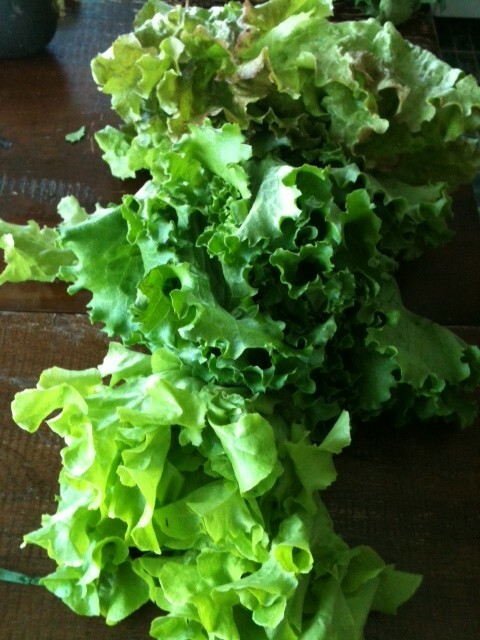 There is a great CSA link party every week, hosted by In Her Chucks, which you can find here. It’s a great way to find other people writing about CSAs. I made a number of salads and sandwiches, but my two favorite dishes from the week were a great pasta with leeks, green garlic, red peppers, mustard greens, and mushrooms (I bought the mushrooms, but every thing else came from the box), and a beautiful salad with two types of beets (roasted in the oven at 300 for a few hours, then left in the fridge overnight to cool), lettuce, radishes, scallions, walnuts, and feta. A few months ago, I took a leap of faith and signed up for a CSA (that’s Community Sponsored Agriculture) option that was delivering to my office. Every week from late April to mid-November a bushel of vegetables will be dropped off at our headquarters cafeteria, filled to the brim with fresh-off-the-farm organic vegetables. Why was it a leap of faith? 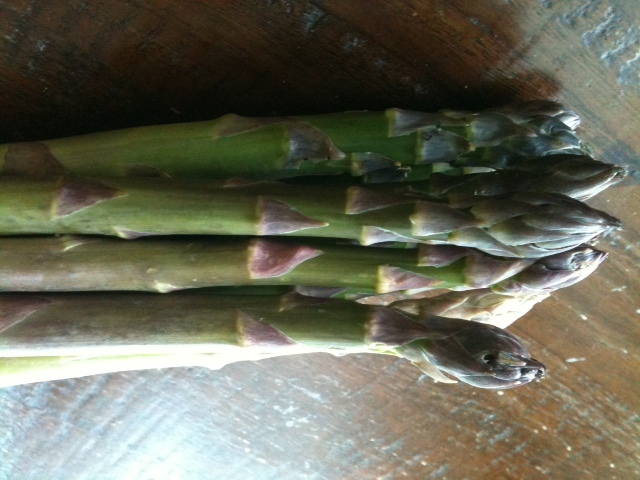 After all, fresh organic vegetables are awesome, aren’t they? 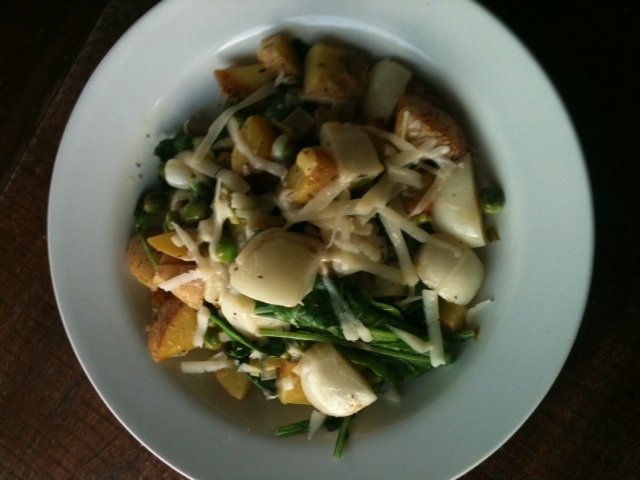 1) A bushel of vegetables a week is a lot of vegetables! 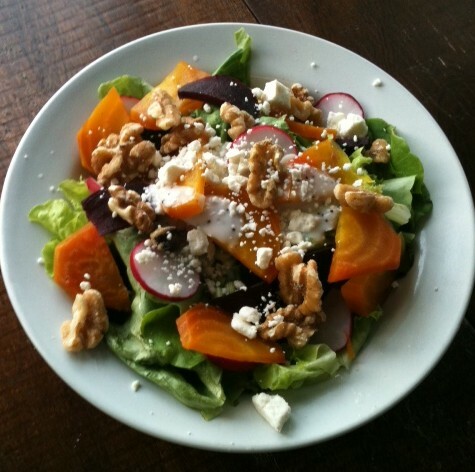 I hate wasting food, and I worry about my refrigerator being filled with rotten produce. 2) Members don’t have any say in what arrives in their box. So if it’s 3 lbs. 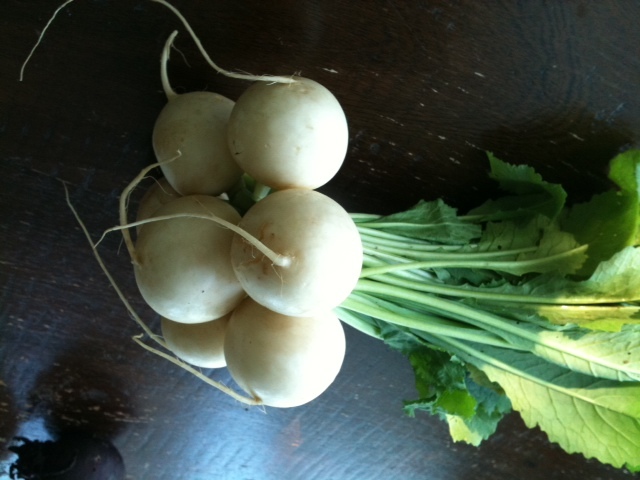 of turnips or another vegetable I’m not too fond of, I’m out of luck. 3) Some of them are quite pricey, and don’t work with my food budget. 4) Trying to remember to drive over to the drop-off location, and arranging my schedule to make that happen seems very inconvenient. 1) Since I’m a vegetarian (well, pescetarian, if you want to be technical), I eat a lot of produce anyway, so this wasn’t my strongest concern. A rep from the farm came to the office and answered a lot of my questions, including the one about the amount of food. 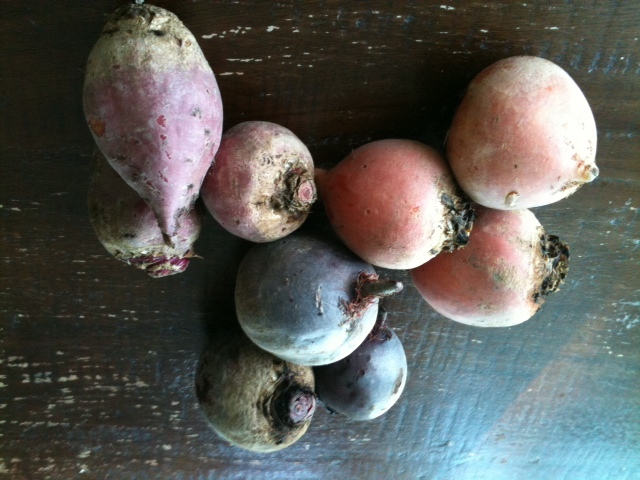 They also offered a half-share with biweekly pick-up for the summer portion of the CSA (June through October). 2) I like trying new things, especially with food. Maybe I can learn to love turnips. 3) With the half-share and a monthly payment of $75 spread over the entire year, my concerns about the price were alleviated. Since I originally researched CSAs a few years ago, the cost of groceries has gone way up. Also, the grocery store nearest my home has TERRIBLE produce. So I often find myself running to the local organic co-op last minute, and that type of grocery shopping gets quite pricey. $75 a month for the bulk of my food will cut my grocery bill by quite a bit. 4) They deliver to my office. It can’t get easier than that–I’m there anyway! So I’m very excited to have inexpensive fresh produce coming to me at work. 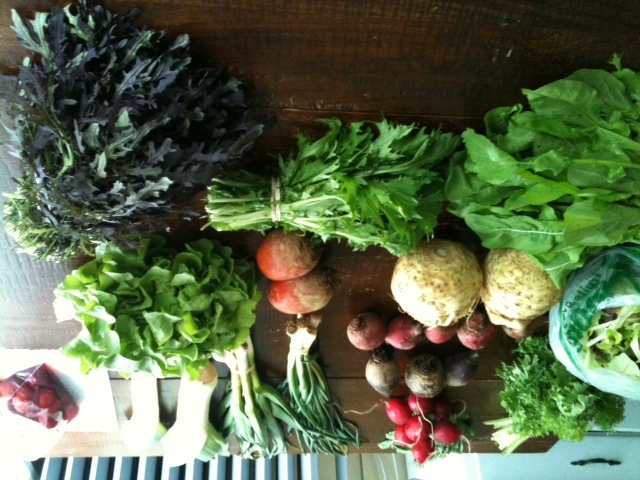 Left to right, top to bottom: Mustard greens, radishes, scallions, green garlic, leeks, frozen strawberries, three types of beets, a bag of mixed salad greens, celeriac, more beets, a head of parnisse, arugula, mizuna, purple mustard greens. 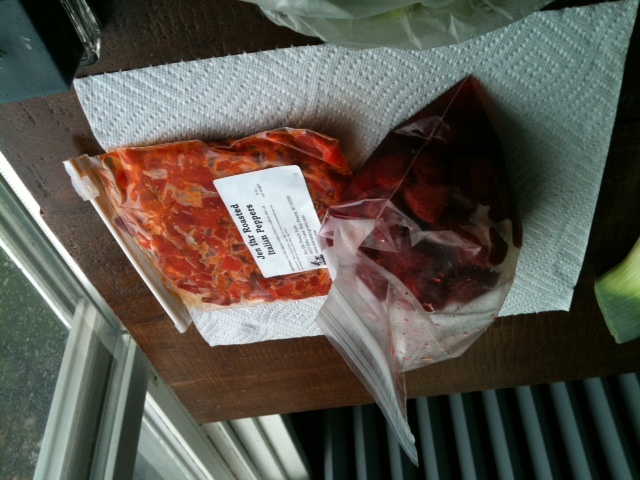 Frozen strawberries and roasted red peppers. 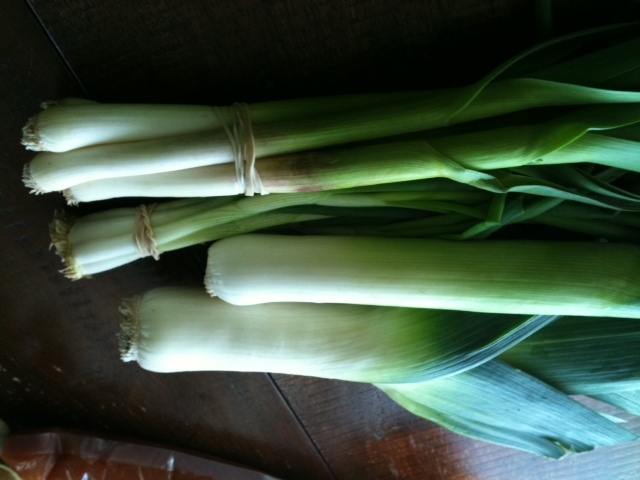 1 small leek, cut in half length -wise, then chopped. Rinsed. Whisk eggs and milk together. Heat butter and olive oil in a pan over medium. Add mushrooms and leeks and cook until just soft. 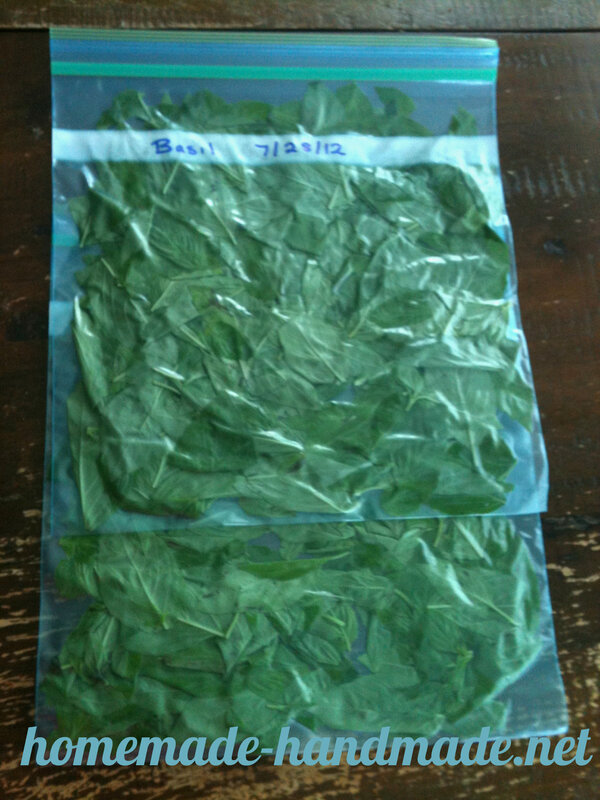 Add arugula and stir in until barely wilted. Turn off heat and stir in red peppers. Pour vegetables into 1 qt. casserole dish and add egg mixture, salt, pepper and half the cheese, stirring to mix. Top with remaining cheese. 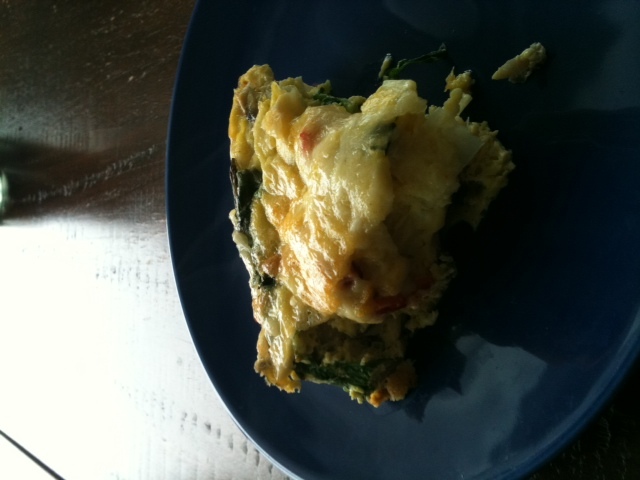 Bake at 350° F for 20 minutes, or until the omelet is puffed and golden brown on top. Serves four. Wish me luck as I try to work through the rest! 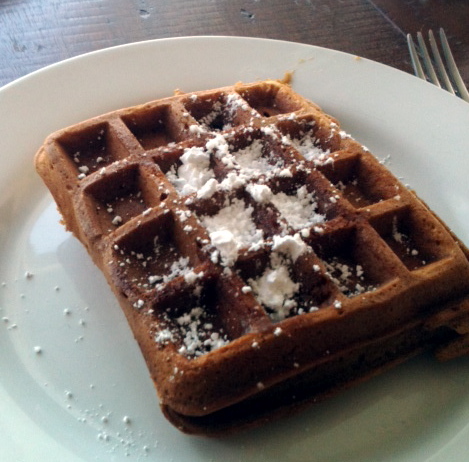 I have to admit, I don’t think I ever would have dreamed up gingerbread waffles on my own. This morning I was looking for something warm and homey for breakfast and I turned to The New Settlement Cookbook* for a basic waffle recipe. As I scanned the basic recipes, I came across “Gingerbread Waffles” and just had to give it a try. Warm, spicy-sweet and perfect for a winter morning. Not only did they taste great (I ate them as the book recommended, with a little bit of butter and sprinkling of powdered sugar), but the texture was perfect—crispy on the outside and fluffy on the inside. These would be excellent with a jam or fresh fruit. 1. Using a whisk in a deep bowl, beat the eggs until light and frothy. Add the sugar, molasses and milk, whisking thoroughly after each edition. 2. In a separate bowl, sift together all the remaining dry ingredients (everything except the butter). Whisk the dry ingredients into the wet (a little at a time will help avoid flour clumps), and then add the melted butter and whisk until blended. 3. Warm up your waffle iron for about 5 minutes, then add your batter to the middle of each grid. (These waffles fluffed up quite a bit so I had a lot of batter dripping out of my first batch—start light and add more batter next time if needed). Cook until the surface is slightly darker and a light crust has formed (about 6 minuted on my iron). 4. Serve immediately, with butter and powdered sugar, or the topping of your choice. Yield: About 16 waffles, depending on the size of your iron. I could have fed 4-5 hungry people with this batch. I froze my leftovers to toast up later.